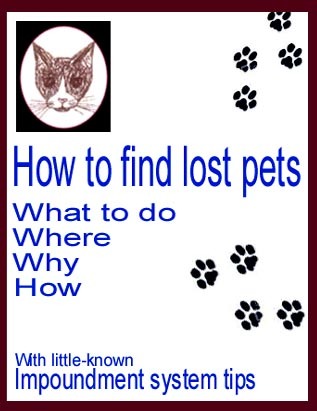 Softcover book "How to find lost pets"
(Note that we use our affiliate site "Notarynut.com" for payment issues, so you may see that name pop up ... not to worry ... this is a related system). 4) Bargain Basement book(s)*, when available. If you want to order only a Bargain Basement book, please email us before placing your order to determine whether a Bargain Basement book is available. We currently have fewer than 5 Bargain Basement books on hand. *Bargain Basement details: Our Bargain Basement books include the complete "How to find Lost Pets" content, but there may be flaws or other manufacturing issues in each copy. For example, there might be some flaking on the book spine, a minor tear or other problem, the incorrect type of paper may have been used in all or part of the book, or perhaps a page was damaged during manufacture, in which case we would remove the page and insert a new repair. A Bargain Basement book may be Reference style or Gift style, at our option. These Bargain Basement copies are perfectly usable for home reference, and are sold at a discount. Currently, we are pricing our Bargain Basement items at only $9.95, when available. All books are hand-made. We normally have sufficient books in stock for immediate shipping. Expect orders received by 10a.m. Monday through Friday to be shipped same day, Priority Mail. We recommend insuring your order (insurance as of 2/28/07 is $1.65); refunds are issued only if book is returned in original condition; no refunds on postage or insurance. *Shipping info: Item 1) above=$6.25; all other items =$8.75. PLEASE NOTE: In the event of a shipping overcharge via our PayPal account, we always promptly refund any excess, as appropriate. how to find lost dogs.